In yesterday’s blog post about the Community Cabinet meeting at the South Fremantle High School I reported a knife had been used by a pro fishing lobby person to slash a banner. I unreservedly want to withdraw that claim. A spokesman for the lobby group called me late today to say it was a lie and no knife was used and the police who had attended had found no evidence of one being used. I accept in good faith the statement by the gentleman who called me, as I did yesterday from a colleague, who obviously was wrong in what she told me. If there is no proof of a knife being used it was not used. That’s the law. I reject however that what I wrote was a lie. I interpret a lie as something that one says when one knows it it untrue. I did not know no knife was used, but am keen to accept the pro fishing person’s statement to that effect, in the assumption he knows this is true. It still bothers me though that a person of that group allegedly damaged a banner of a group with opposing views. There is no need for that kind of aggression. John Howard would have called it very un-Austalian. To make it loud and clear one more time. There is no evidence that a knife was used in the attack on a banner at yesterday’s Community Cabinet meeting. I have no interest whatsoever of accusing people of things they have not done and deny that my reporting was biased. If I had seen, or heard off, other people misbehaving I would have reported it as well. I tell it as I see it and if I get it wrong I will always be happy to apologise and rectify it. That is the reason I made this a new blog post and not just a hidden comment to yesterday’s post. Being Dutch is not always easy. People are of the opinion that Dutch people are mean, greedy, rude and arrogant, which I believe is unfair to most of the Dutch people I know. There are a few oxymorons though when contemplating the Dutch; diplomacy, fine dining and navigation, are some of those. I can’t think of a diplomatic Dutch person, most are so honest and straight forward that is borders on the abrasive, but what you see is what you get. People who believe that raw herring with raw onions, or Stampot, a mash of onions, carrots and potatoes, are delicacies, obviously have no claim to Haute Cuisine fame, like the French. Last but not least we have Dutch navigation. Now that is a contradiction in terms! The proof of that is all over our coasts and we even have a Shipwreck Museum in Fremantle that commemorates the Dutch bumping into anything. 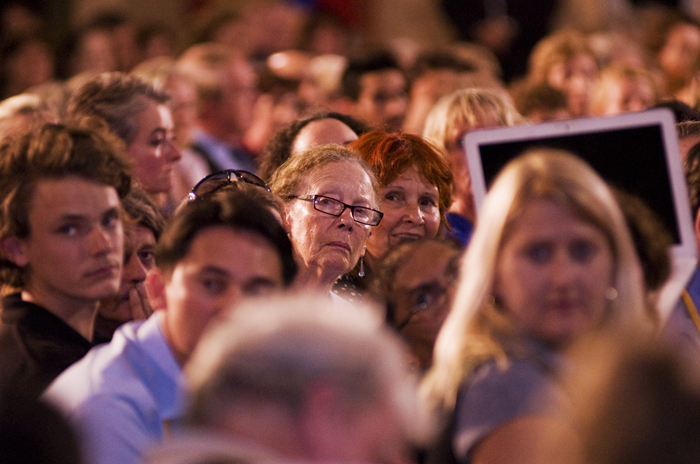 The COMMUNITY CABINET meeting held at the South Fremantle Senior High School was a big draw card for the locals. It was party time outside with good music, a real and a fake sheep, a gorgeous mermaid and her helper and many community groups trying to get their message across with placards and large banners. It was all in good spirit but for a few old men in the pro fishing lobby group who took it upon themselves to abuse people with a different opinion. I was told that one of them even slashed a banner with a knife. Idiot! Prime Minister Julia Gillard impressed at every level, first connecting in a very warm and natural way with the people when mingling with the crowd, and later at the Q&A where she performed strongly. I took lots of photos for the Fremantle Herald, so I am going to publish only one of them here. If I have more energy tomorrow I might put some more on. It’s been a long day. Merrick Belyea is a figurative painter in the tradition of historic painters such as Matthias Grünewald and Pieter Bruegel, yet brings a 21st century cynicism to the way the human form is depicted. Bold and striking paintings portray a humanity under assault from an unseen enemy and ask the viewer to consider who this enemy may be. In these paintings, Merrick Belyea uses high-octane reds, oranges and bright yellows to represent the human form under siege. These figures are twisted, scrubbed, erased and chopped to an inch of their lives, leaving behind only a ghost of their existence. The tension between the haunting subject matter and the strange poetic beauty of the paintings, engages both the eye and the intellect. The secret of eye-catching photos often is the time of the day they were taken. 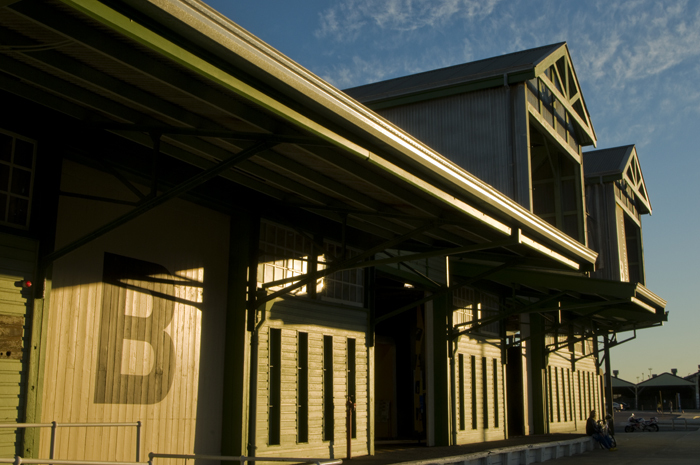 Early and late light always enhance scenery, as this sunrise photo of the B Shed ferry terminal on Victoria Quay in Fremantle shows. Today I want to praise someone who has done so much for Fremantle. We often forget to show our gratitude to those wealthy people who sacrifice so much to give back to the community, those corporate citizens who go out of their way to beautify our cities and lives. Without this person we would not have had this iconic building that passengers of cruise ships see first when going ashore. While Sydney got the Opera House and Melbourne Federation Square, we in Fremantle, thanks to the generous donation by Marilyn New, have the Woolstores. Thank you Marilyn for generously giving us this monument to decay and greed. 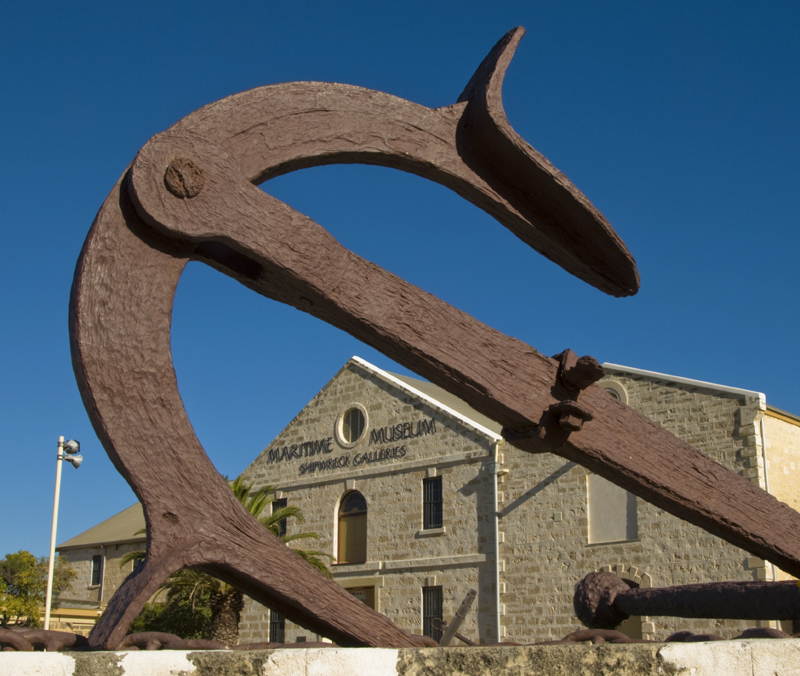 The people of Fremantle will be in your debt forever. The City Of Fremantle has been serious in its attempt to revitalise King Square. On Friday Summer Square Sounds finished for this season and today the MUSIC TO OPEN YOUR MIND event was held to raise awareness of mental health. As someone who suffered from depression 16 years ago I welcome that mental health has been discussed more openly in recent years. If today’s event only makes one person aware that help is available and that you don’t have to fight depression all on your own, it has been money well spent. The SKILLED CORPORATE TRIATHLON was held in Fremantle this morning and hundreds of people joined in. The swim leg started from Bathers Beach, after that the runners went sight seeing on the South Mole, before grabbing their bikes on The Esplanade and speeding along Marine Terrace. GREAT PRAM PUSH SOON ON! 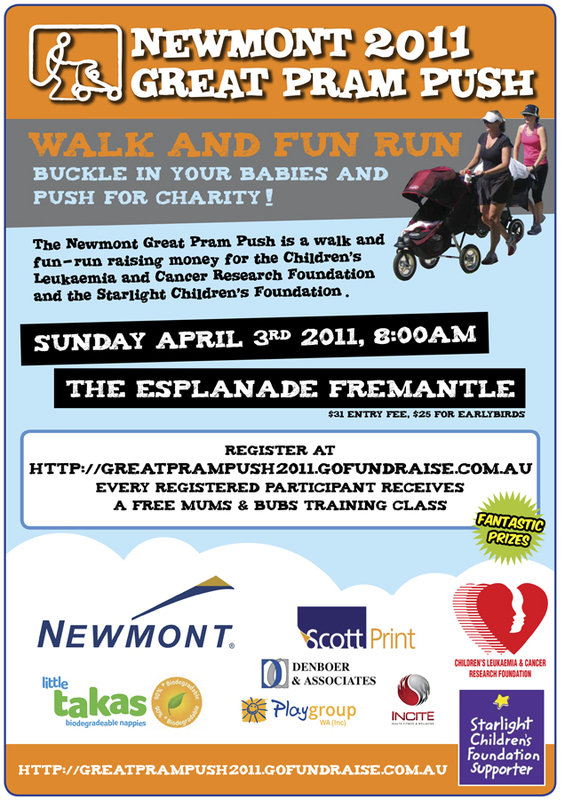 The Great Pram Push 2011 will be on in early April, so don’t miss out on the fun and help raise money for the children leukeamia and cancer foundations. Comments Off on GREAT PRAM PUSH SOON ON!